So I don’t know about where you live, but around these parts, there’s a whole lot of farming going on. Everywhere you look there are sheep and goats and pumpkin patches and apple trees and blackberry bushes… there’s enough food being harvested in a 30 mile radius of us to practically feed the entire state of Oregon! Well, maybe not the whole state, but believe me when I say there’s a huge abundance of food. And yet for some reason, everyone around here seems to shop at big chain grocery stores, Wal-marts and Costcos for all their meat, produce and dairy products. I just don’t get it. Is it out of convenience? Because of price? It definitely can’t be due to the quality of the food. One bite out of locally-grown and organic strawberry and you’ll never again purchase a pint of furry, squishy berries they offer at the grocery store. I find it a shame that with the great plentitude of quality food being harvested so close by their homes, people aren’t taking more advantage of the situation. Luckily, mi mama and papa finally came to their senses and realized the bounty of wondrous crops being grown around here, some practically down the road from our house, and signed up for a local CSA. It’s environmentally-friendly because the produce doesn’t have to be shipped from all over the country in order to get to you, thereby reducing the amount of gasoline used and pollution being released into the air. Now on to the recipe. Like my picture from the previous post might have alluded to, I did in fact come up with a stir-fry dinner for mi mama and papa that particular evening. And it was pretty darn magical, if I do say so myself. Could have had something to do with the fresh and delicious produce and ingredients involed, or perhaps it was because I am a genius in the arts of culinary expertise. You be the judge. 1) Heat 2 tsp safflower oil in a large wok over medium-high heat. Add garlic, ginger, onion, bell pepper, carrots, snap peas, and zucchini and saute 5-7 minutes or until veggies are crisp-tender. Transfer to a bowl and set aside. 2) Heat remaining 2 tsp oil over medium-high and add meat or meat alternative. Saute until cooked through and chicken (if using) is no longer pink. 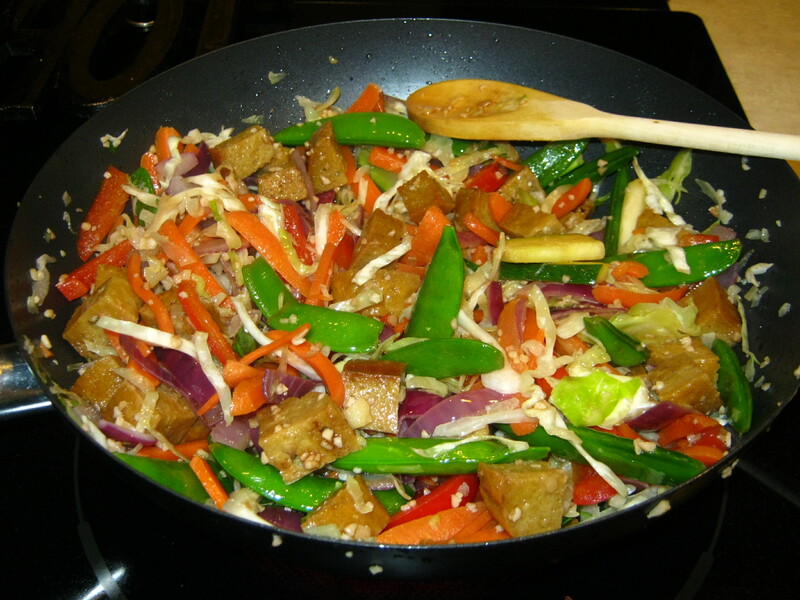 3) Add vegetable mixture to wok along with shredded cabbage, sesame oil and soy sauce. Cook 2-3 minutes or until heated through. 4) Garnish with sesame seeds and serve atop a bed of fluffy rice. So simple, so easy and oh so very tasty. And a great way to use up some of the veggies from the CSA box. Now only about 12 more pounds of produce to go. Hmmm, now which of these am I going to use tonight? Anyway, I was distracted. CSAs. I live in Michigan and take full advantage of the Farmer’s Market in the summer–I love it entirely too much. But in the colder months (half the year,) I have to rely on the local grocery store. Luckily one chain uses Michigan farmers as much as possible, so that helps. I refuse to buy produce at WalMart. I have thought about doing a CSA, but it’s not economical seeing as I’m the only one who would be eating it. Plus, I tend to stick to the same veggies, and CSAs are usually a variety of different items. In theory though, I love the idea. Hola Senorita Abby! Gracias on your sweet comment to my most recent glamour shot. Te amo 🙂 As far as CSA’s go for a single muchacha like yourself, I can see why you weould be deterred from joining one. However, you could join with another friend or a family member and just split the veggies and the cost each week. That way you’d both be getting fresh stuff and still able to support your local farmers. It’s a lot cheaper this way, too, than buying it at the Farmer’s Market. Just an idea. I find it really fun to pick up my produce from the farm knowing that it just came out of the ground that very morning. The only time when dirt on my food actually makes me giddy. 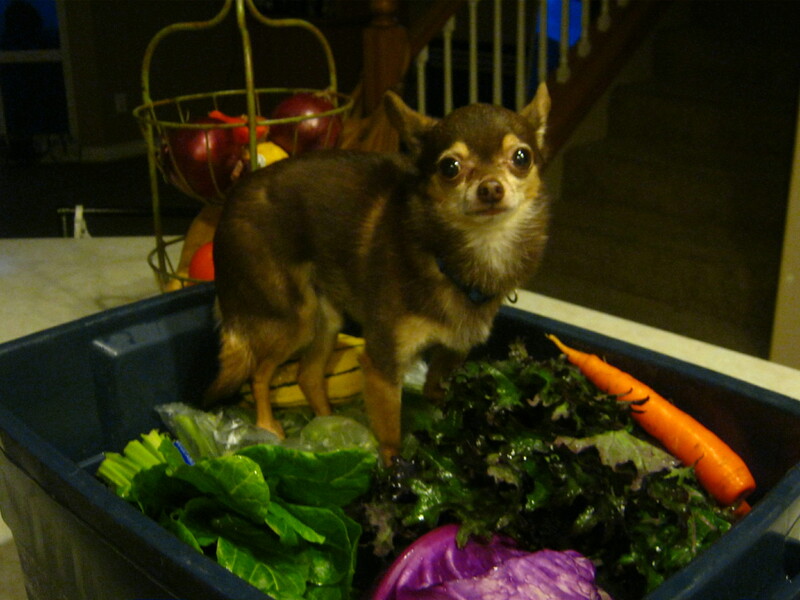 I have really wanted to join our CSA, but it is very pricey. Do you find that it saves you money? I still periodically buy my veggies from the farmers market to support them, but I don’t know the price camparision between the two. Any advice would be appreciated. I buy veggies anyway and would love to support our CSA more. Hola Hannah, thanks for the response to my post on CSA’s. I definitely find our’s to be more cost effective and saves us money every week on fresh veggies. I don’t know how much they are charging at the CSA in your area, but our’s works out to costing around $18 a week. That’s crazy cheap, in my opinion. Especially since all their produce is organic and there’s a huge variety of items they put in our box each week, plus a jar of fresh honey every other week. Overall, I just like the idea of supporting my neighbors and helping to keep our world more green.